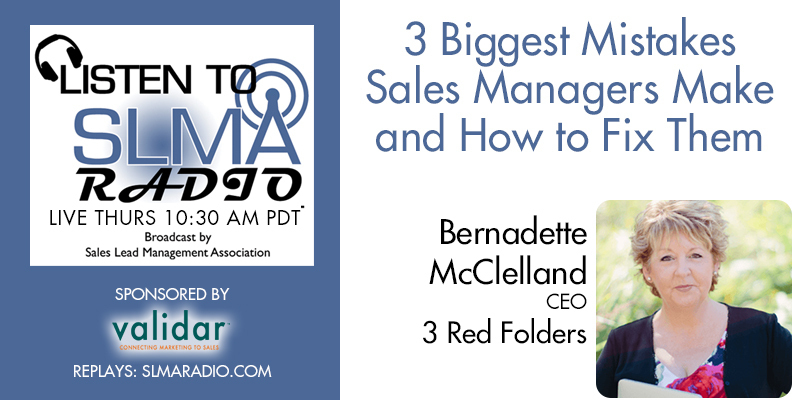 In this episode we interview Bernadette McClelland, CEO of Three Red Folders. Of the hundreds of clients she has had for her sales performance and sales leadership consultancy, we asked her to discuss the most common mistakes sales managers make. The host is Jim Obemayer. Bernadette McClelland is CEO of 3 Red Folders, a boutique sales performance and sales leadership practice headquartered in Melbourne Australia. She is also the founder of The Hive – a platform for trailblazing women who want to do B2B sales differently. Bernadette has been a Sales Coach for Harvard MBA Students and having held senior business development roles in Corporate Australia, owned a 7 figure family business, been the APAC business coach for Anthony Robbins, authored five books on selling and personal leadership, has clients across 14 countries and 4 continents, she is clearly a respected industry resource who loves to make a difference in the business world. We work with mid-sized business who aren't making their numbers and don't know why or who want to differentiate themselves but don't quite know how. Finding and keeping the clients they REALLY want is what it's all about! If you want to become a respected industry resource - we will bring SCIENCE BACKED, EVIDENCE BASED sales approaches that will ensure your people consistently embrace, engage and execute!